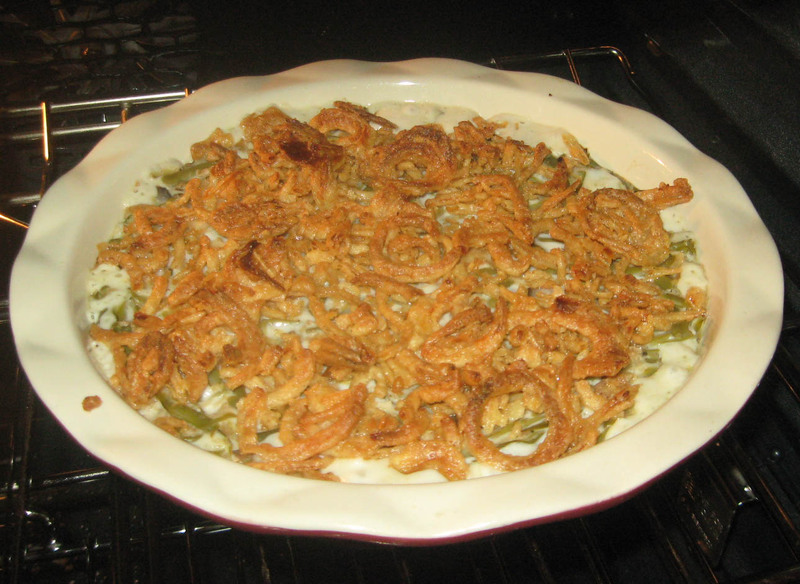 It just wouldn’t be a holiday without a Campbell Soup green bean casserole. There’s just something about this rich holiday side dish topped off with dried onion rings that works well for special dinners. My aunt always made green bean casserole for family gatherings. This was mainly because she couldn’t cook much of anything else. She’s was also very slow at getting things done, and this side dish only takes a few minutes to stir together and then thirty minutes in the oven. There were a few times my aunt acutally made it on time, so we didn’t have green casserole for dessert or with the leftovers later in the day. Now I generally whip up a green bean onion casserole for our holiday meals, because the kids and the men especially seem to like this side dish. First drain the water from the green beans. If you dump the beans in with the water, the casserole is runny. In a mixing bowl, combine the drained green beans, milk, soup, pepper, and all but 2/3 cup of the dried onion rings (which are used later as the topping). You can mix this in the baking dish, but the soup and milk will splash a little up the sides of the dish, and then casserole looks kind of messy with darker splashes coming up the side when it’s baked. Lightly grease an 8 x 8 (or close) casserole dish. Use a pretty one, because you’ll serve right from the dish. Pour the bean mixture into the casserole dish and use a spoon to make the top even and smooth. Don’t mash. Just lightly run the spoon over the top. Bake at 350 degrees F for 30 minutes. Remove from oven and sprinkle the reserved 2/3 cup of French’s onions on top. Pop back in the oven for 5 minutes until the onions are lightly browned. That’s it. Quick and easy. And, most folks do love this one (even if they don’t admit it).